"An onnagata builds a mask-like face by applying dense white makeup and by pulling and tightening facial skin through various methods. Matsue V quoted his father Utaemon VI saying, “Your face is a living mask." Utaemon VI and other older contemporary onnagata emphasize the liveness of the onnagata face. 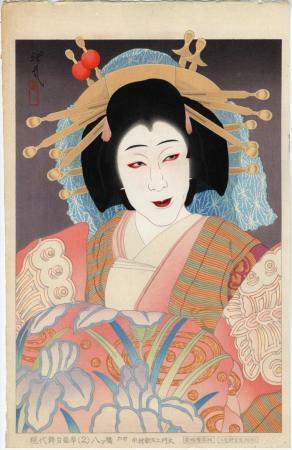 They take pride in their faces' expressivity, saying it is one of their twentieth-century innovations to onnagata art. But this should not be misconstrued to mean free-form or realistic expression. Rather, there is a greater range of stylized facial expressions and methods of making up their features. Facial “expression” depends on the individual onnagata who finds his own way to manipulate the onnagata gender standards of facial beauty: small, delicate features in a moon shaped face. A nose with a high, narrow, and straight bridge is considered an additional asset. In ordinary situations, only slight movements of the eyes, a tiny puckering between the eyebrows, and pursing the lips make up the standard vocabulary of facial expressions. Depending on the role type, under emotional duress, there are additional stylized facial expressions and makeup that will distort the features. Onnagata use large and intense facial expression only under extreme conditions such as death, mourning, or radical transformation. In Japan, smiling with teeth showing is not considered beautiful. Utaemon VI added a large, mocking smile, almost a leering grin, to his famous courtesan role Yatsuhashi of Kagotsurube (Kagotsurube—the name of a famous sword). In this case, the courtesan role is reacting with this hideous grin to a jovial but ugly and pock-marked male country bumpkin character, who falls in love and gets used and refused. He eventually murders the courtesan. Utaemon VI’s wide toothy smile was considered an incredible innovation, but now has become a standard kata for that role. It is striking to see the perfect painted face and rose-bud mouth crack open so suddenly and flash the face beneath." Quoted from: Beautiful Boys/Outlaw Bodies: Devising Kabuki Female-Likeness by K. Mezur, p. 191.